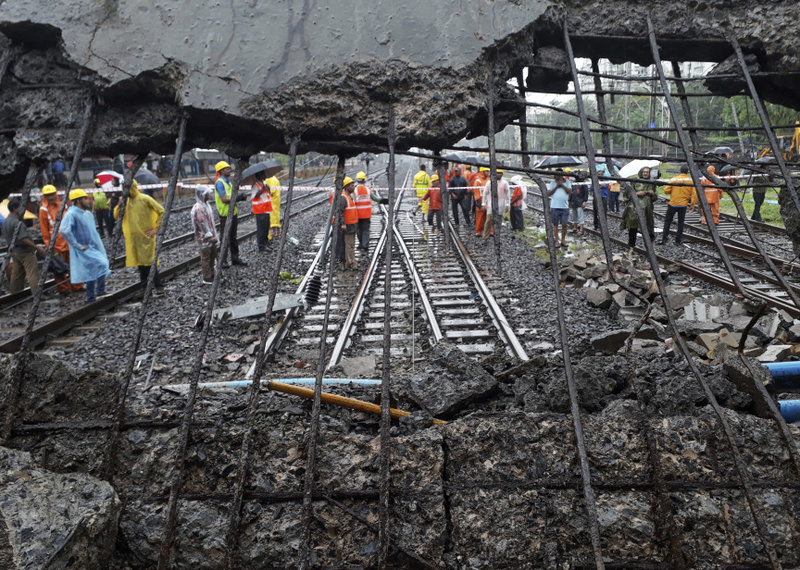 MUMBAI, India (AP) — Part of a pedestrian bridge at a Mumbai train station collapsed Tuesday morning during heavy rains, trapping at least one person and injuring five. The concrete slab fell onto empty train tracks, damaging part of the platform roof and high-tension electric wires. Rescuers were cutting through the concrete and iron of the fallen slab, while engineers were working to restore power and train services. The continuing rains were hampering rescue and relief operations at the Andheri station in Mumbai, India's financial capital. The overpass connects the eastern and western portions of the Andheri railways station, and the collapse stranded passengers during the morning rush. Railroad spokesman Ravinder Bhakar said no trains were passing in the area at the time of the collapse around 7:30 a.m. He said the incessant rains seemed to have caused cracks in the bridge, resulting in the collapse. Aaj Tak television news channel says the bridge was more than 50 years old. Police official Yaibhav Nigade said at least five people were injured and have been hospitalized. He said at least one person was still trapped in the debris. India today TV broadcast quoted an eyewitness saying that he heard someone calling out to be saved. Another witness said some people were trapped under the concrete debris. India's railway minister Piyush Goyal ordered an investigation. In a tweet, Goyal "directed officials to speed up repair work and rapidly restore traffic in close coordination with other departments." Every day, millions of commuters use the sprawling train network in Mumbai and its suburbs. Last year, at least 22 people died and 32 others suffered injuries in a stampede triggered by a rumor that a pedestrian overpass had collapsed after concrete chunks fell at another railway station.